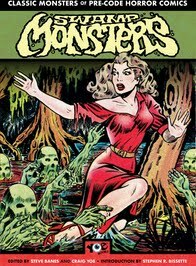 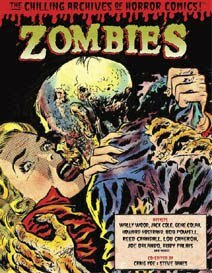 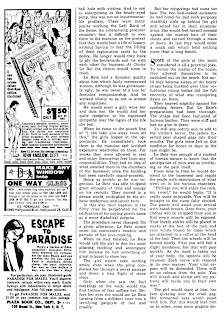 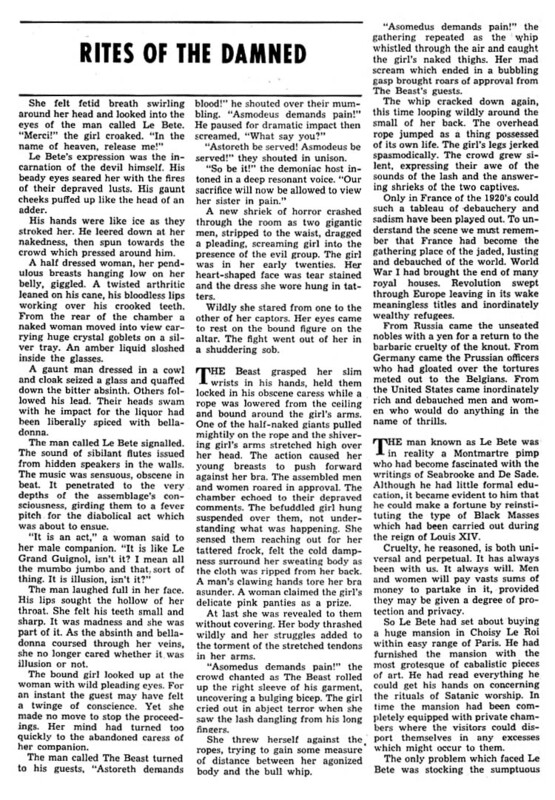 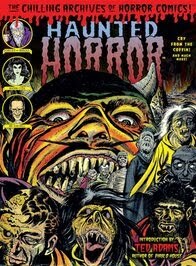 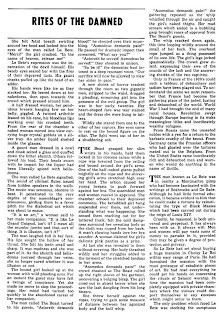 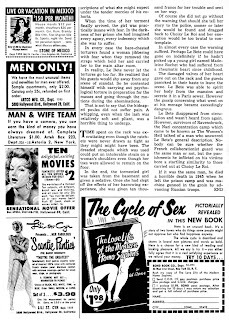 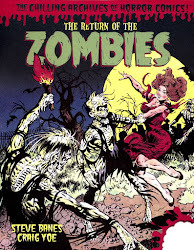 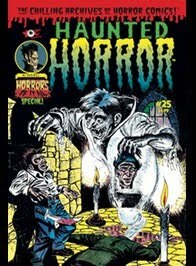 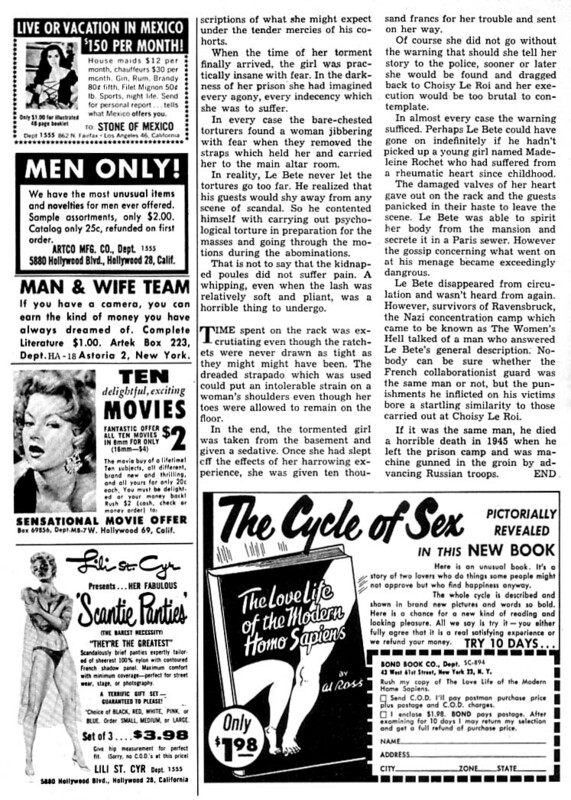 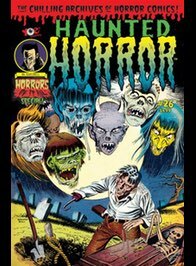 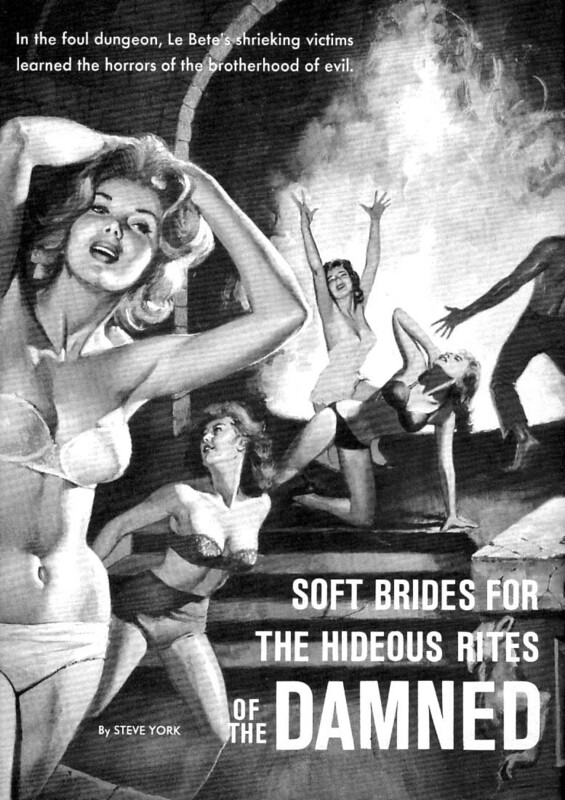 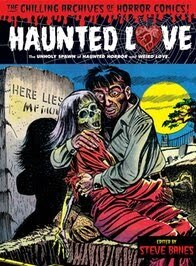 Soft Brides for the Hideous Rites of the Damned! 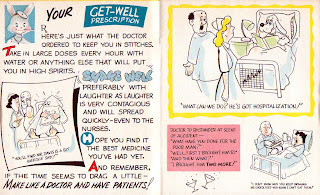 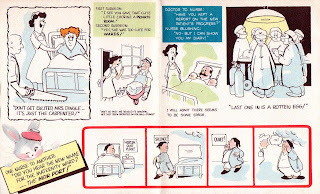 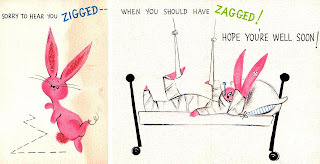 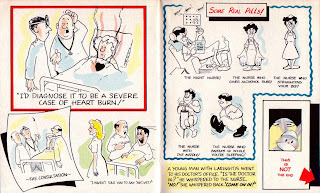 A Hospital Cartoon-Book for You! 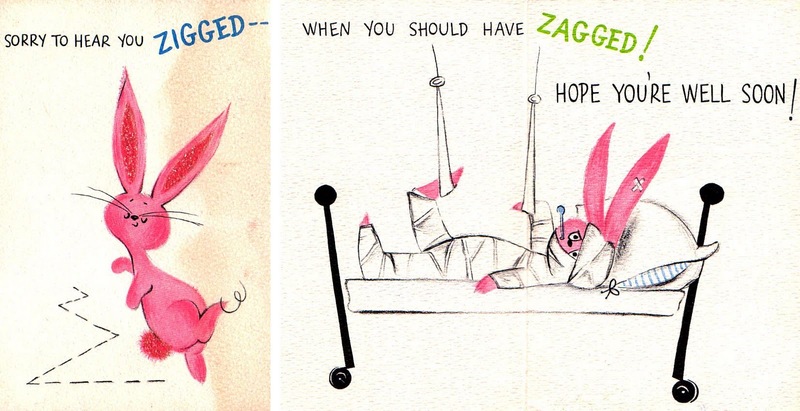 As you can see, we haven't fully recovered from our last "get well" post, so once again we're prescribing some laughter as the best medicine. 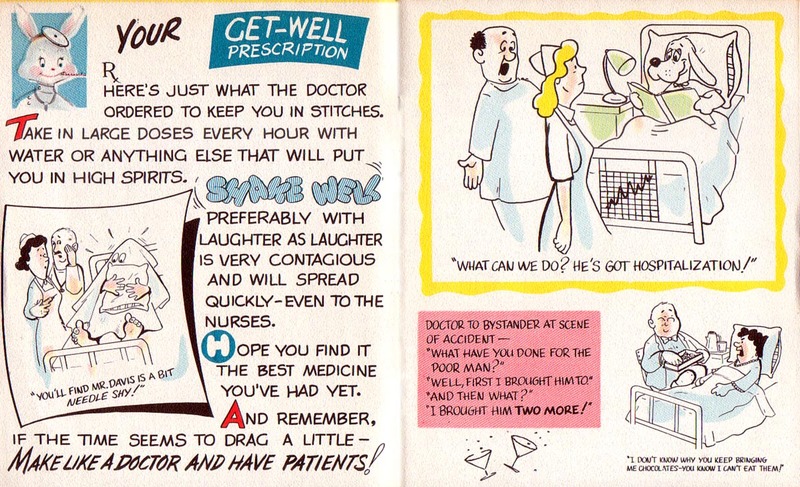 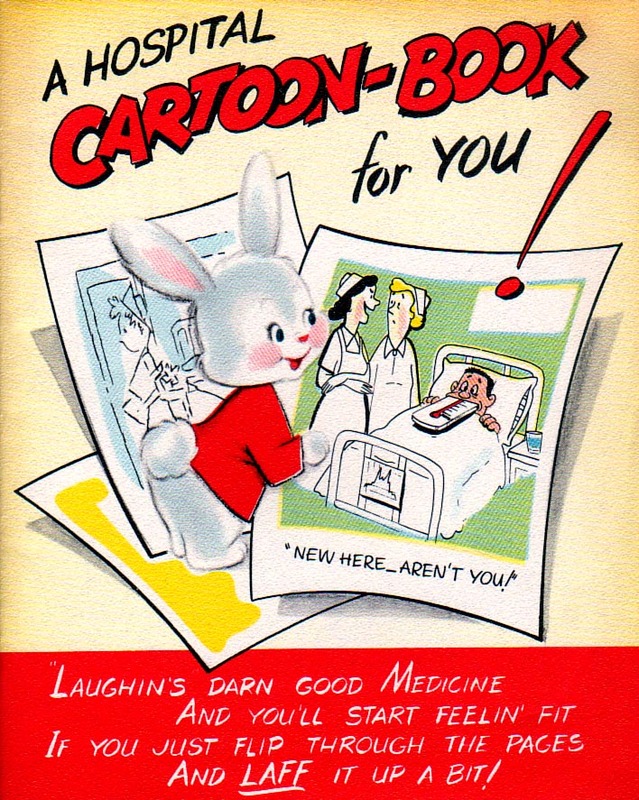 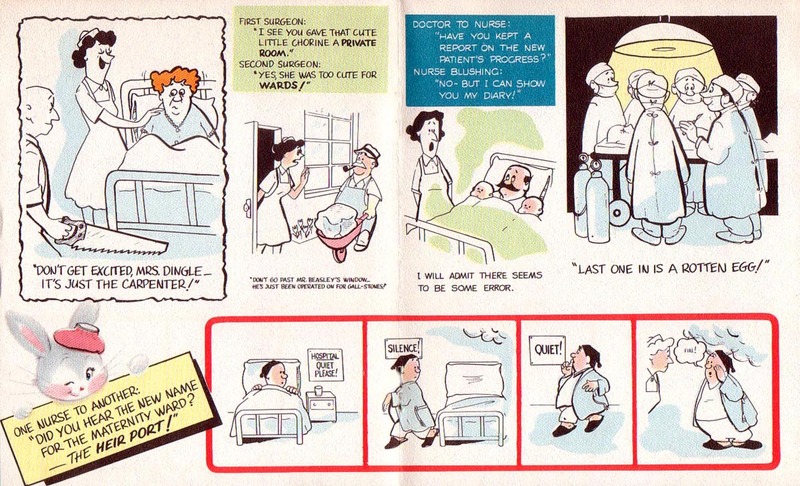 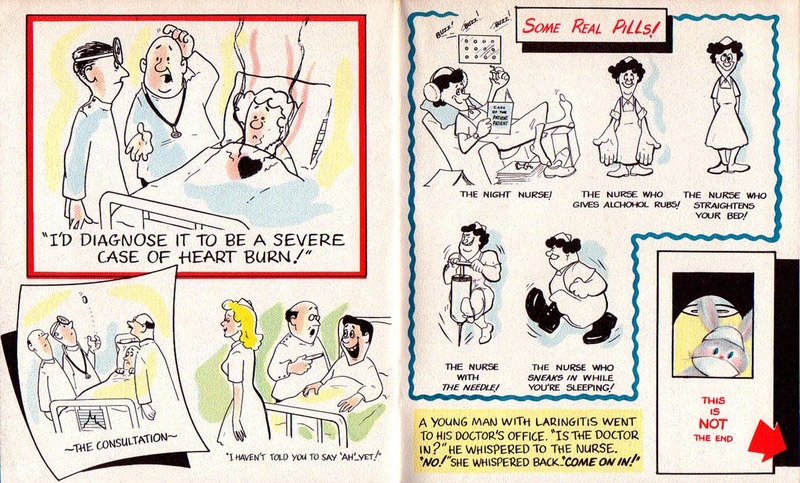 "A Hospital Cartoon-Book For You!" 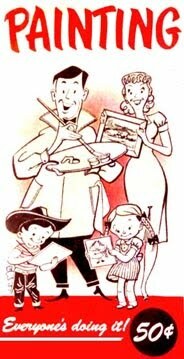 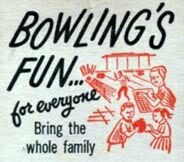 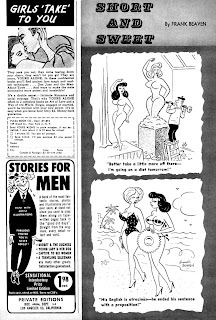 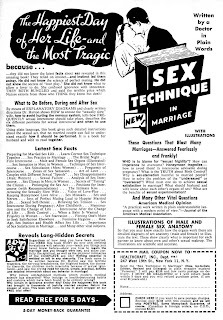 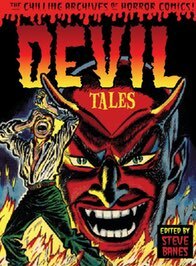 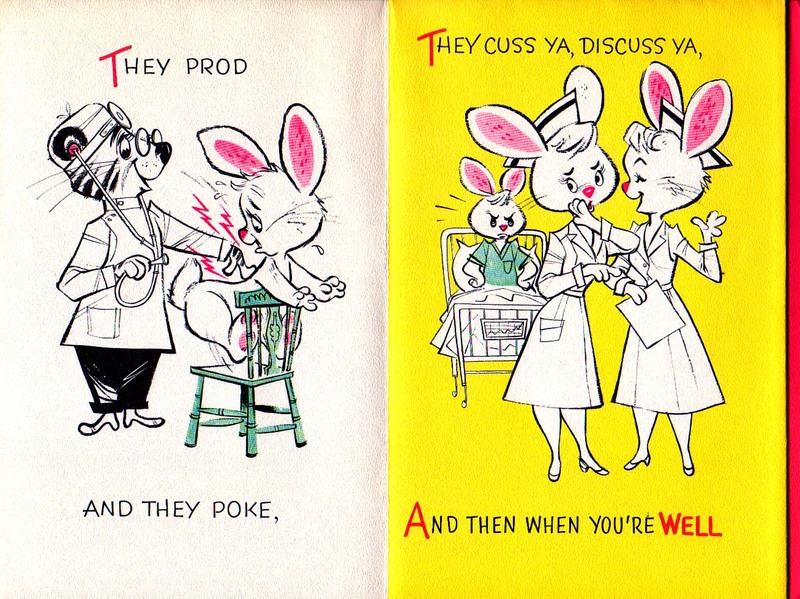 is a fun little multi-page greeting card / joke book put out by Norcross (of course) in, I believe, the 1950's. 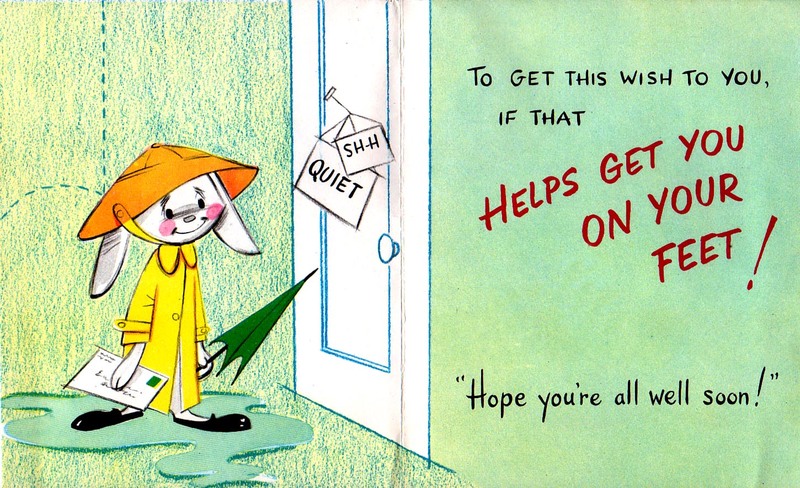 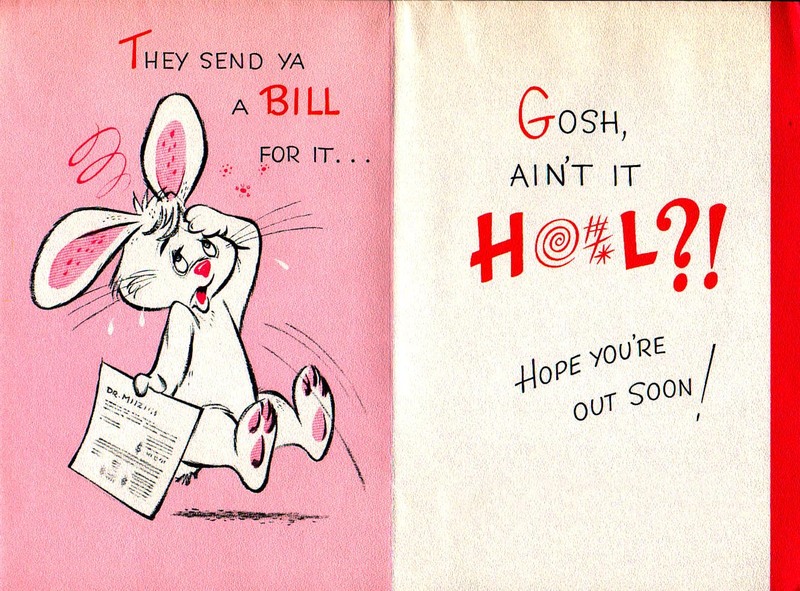 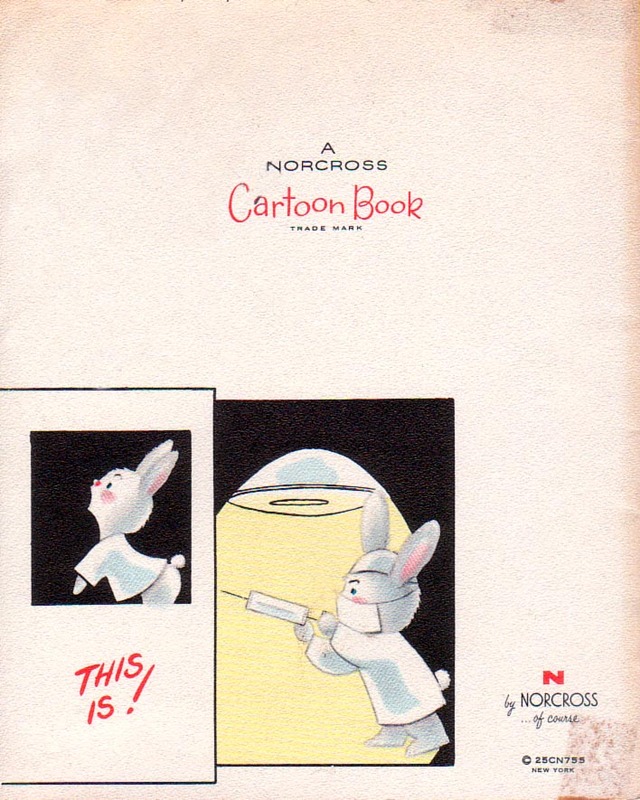 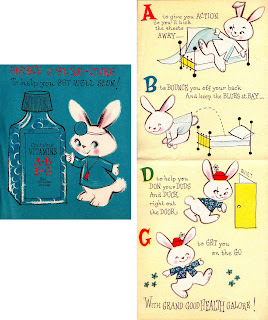 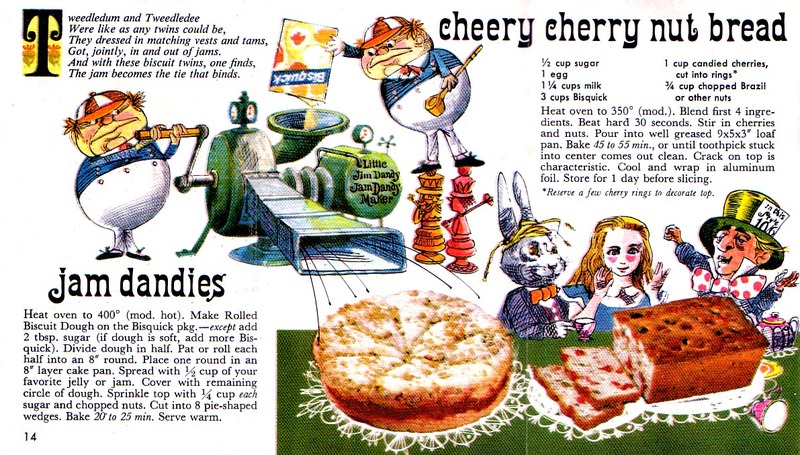 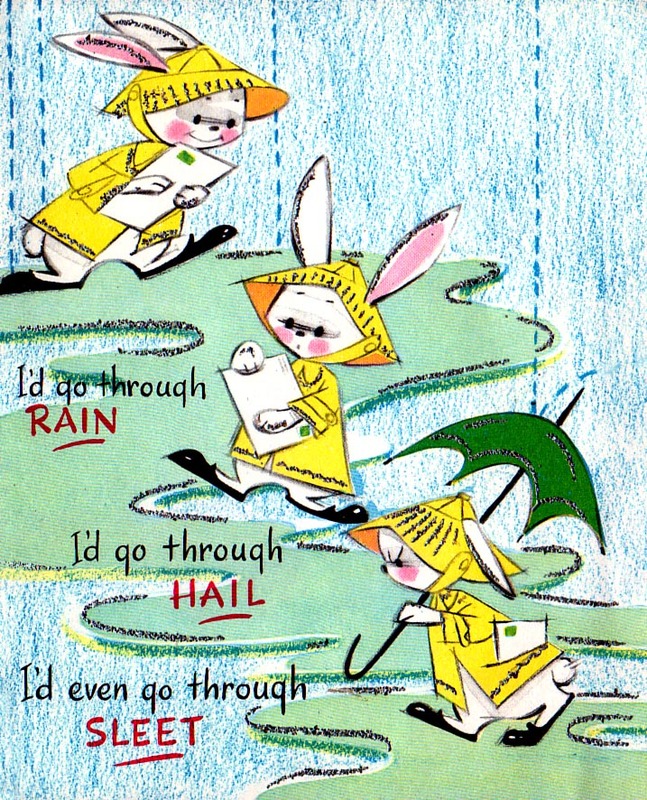 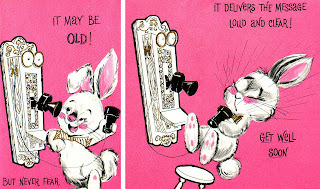 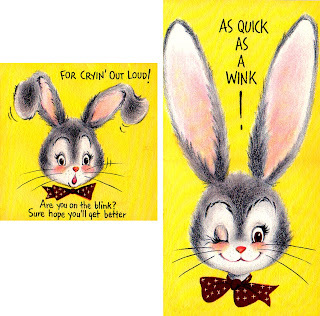 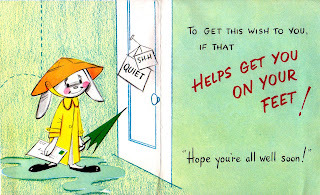 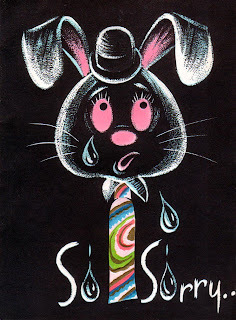 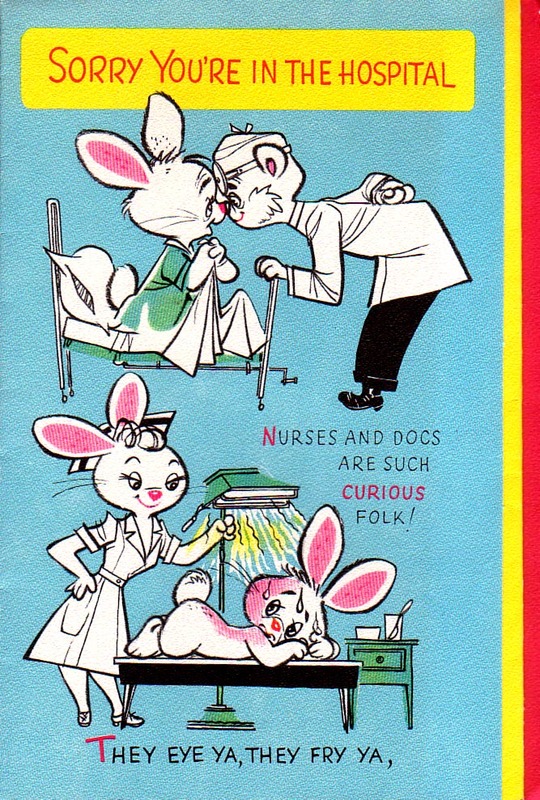 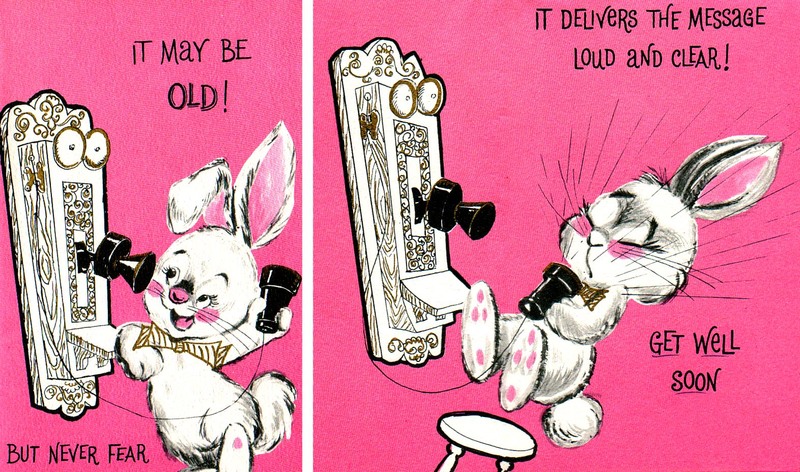 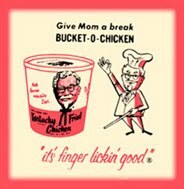 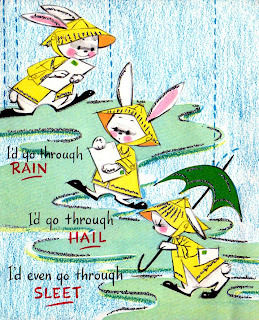 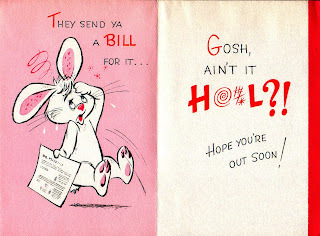 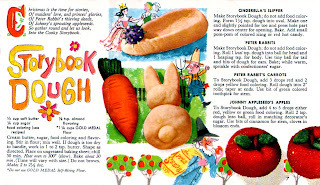 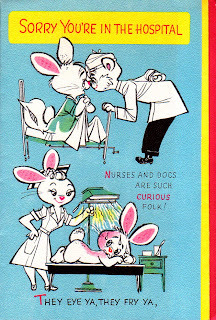 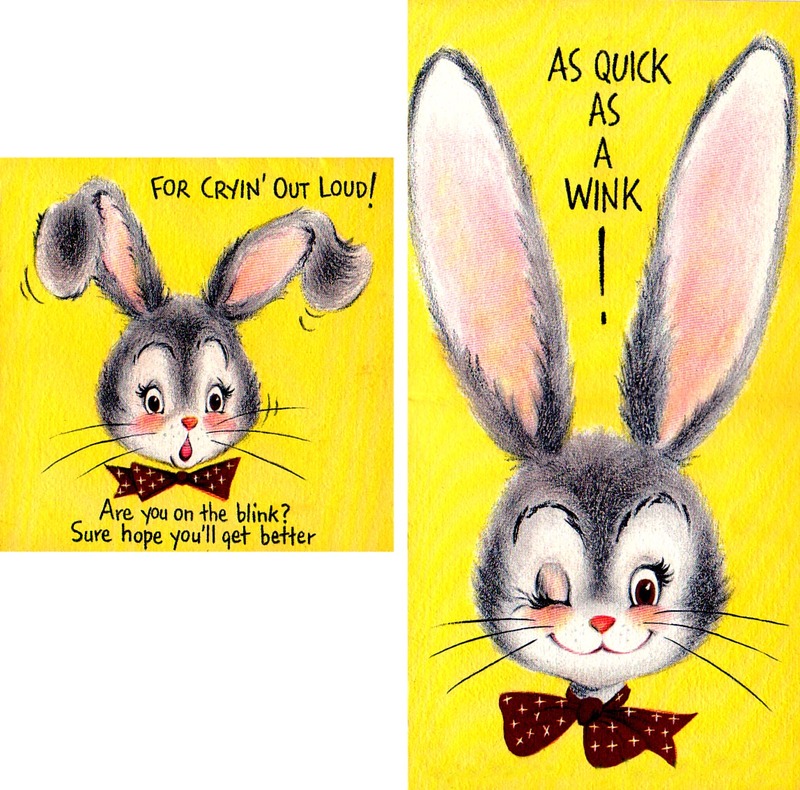 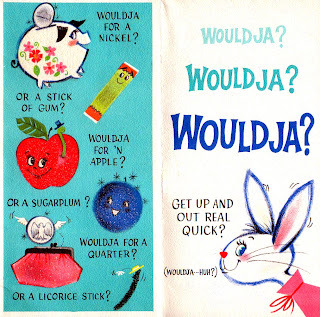 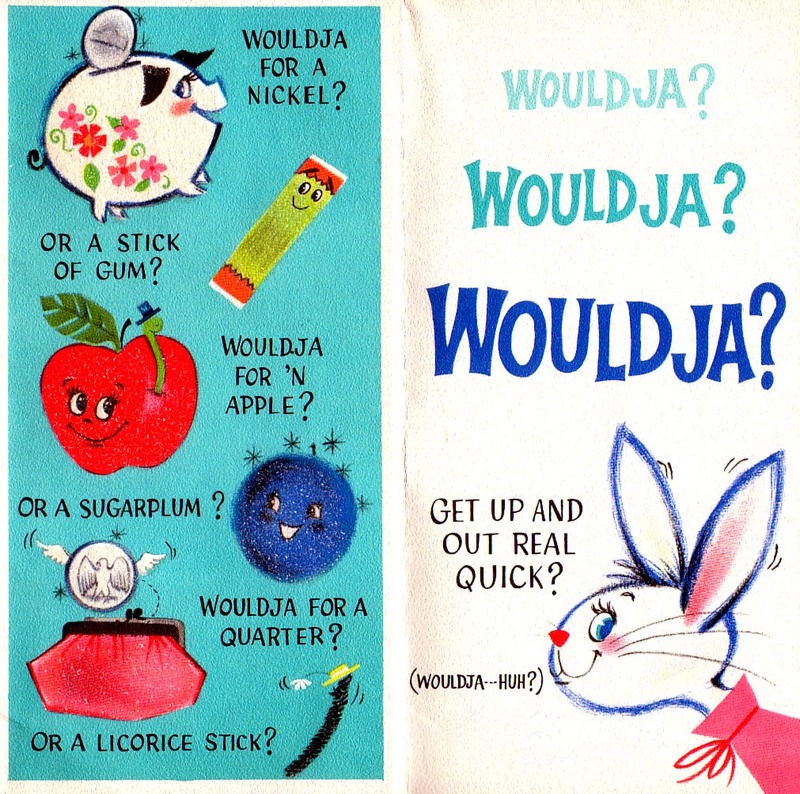 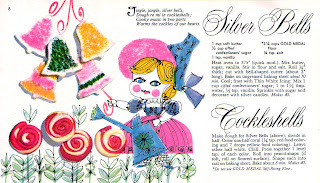 The supremely cute rabbit mascot known as "Honey Bunny" graced many Norcross greeting cards from this era, and his inclusion here as the host to this simple sampling of cornball gags and text tumblers is like icing on the cake-- until even Honey Bunny himself gets it in the end! 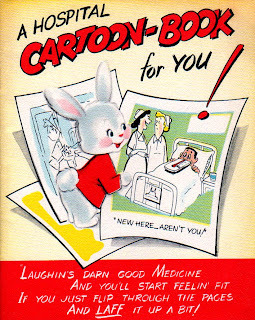 Now see, you're feeling better already, aren't you? 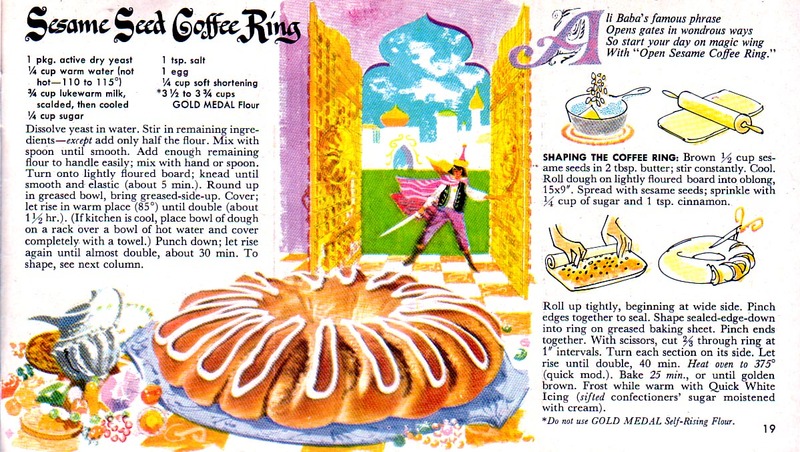 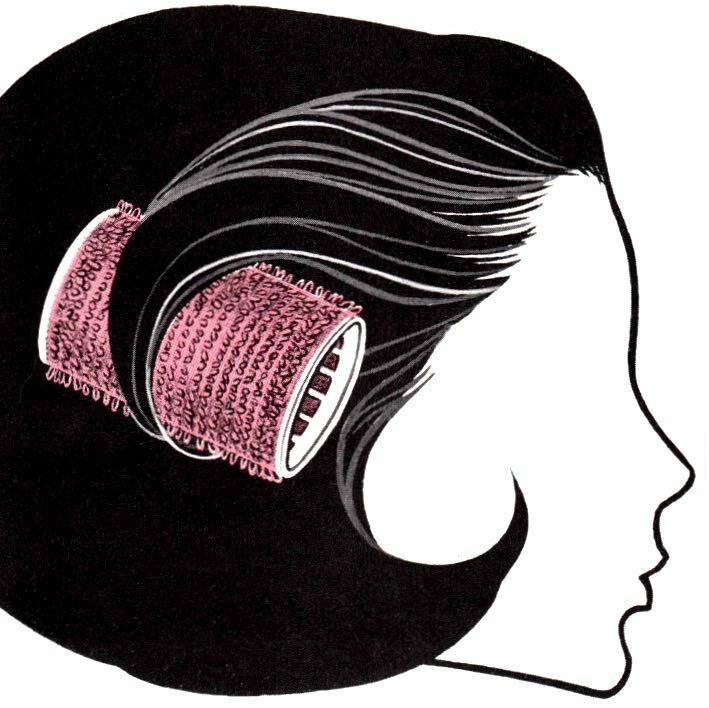 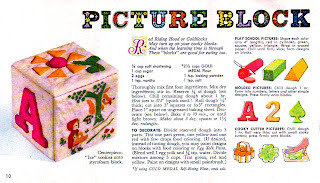 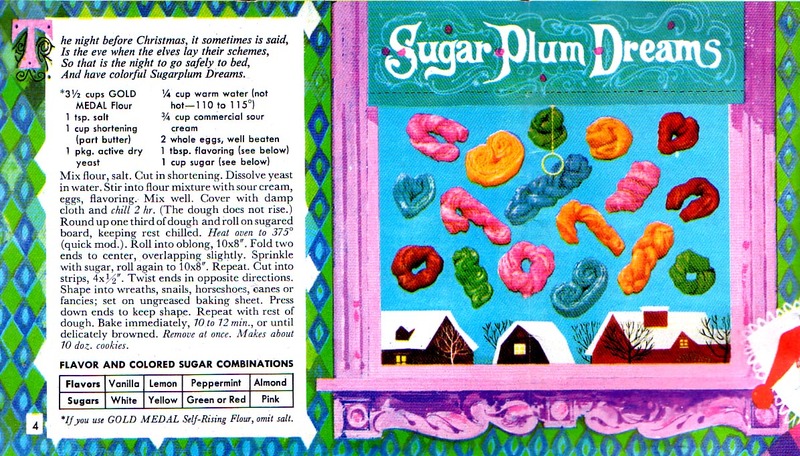 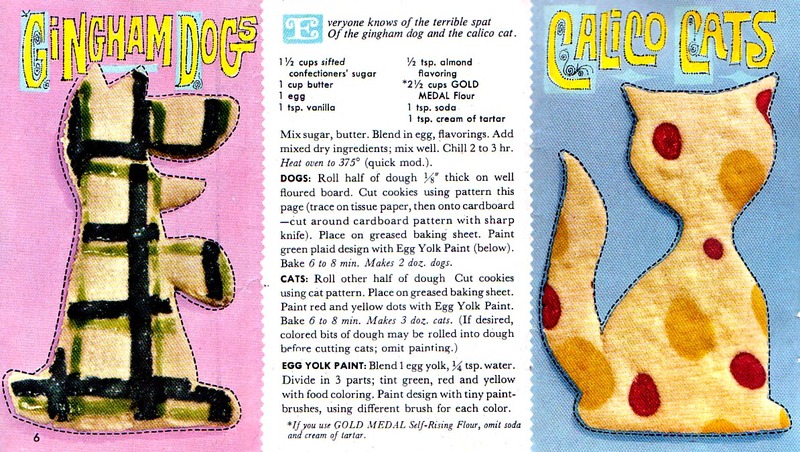 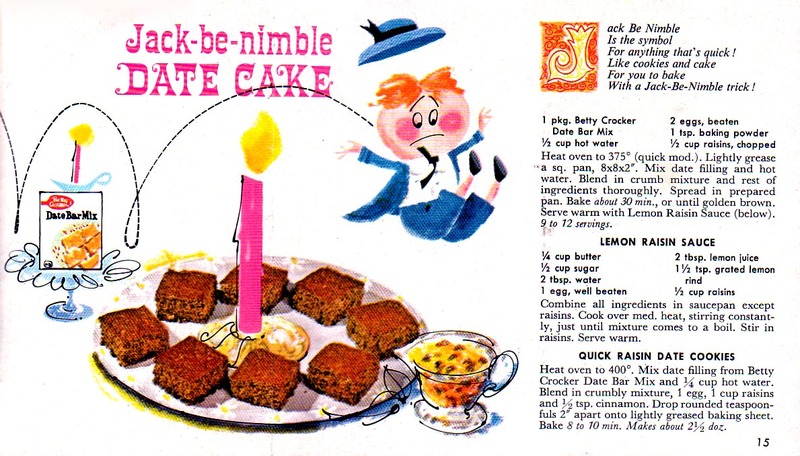 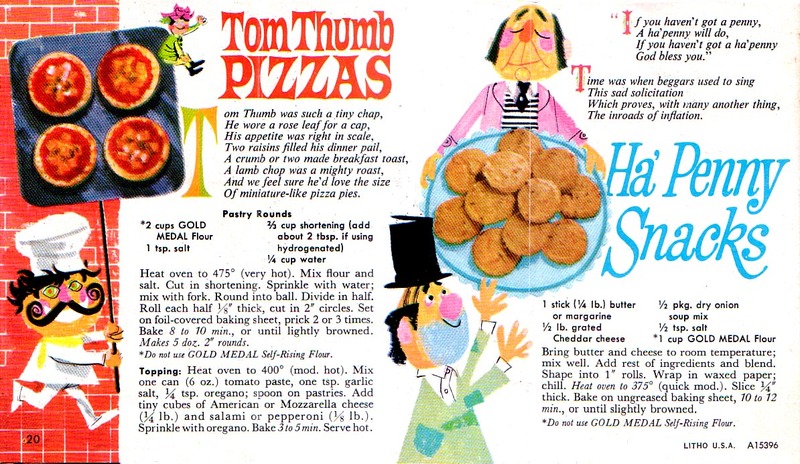 Time once again to head into the kitchen and whip-up some tasty treats, courtesy of another of the many endlessly creative and fantastically illustrated (1960's?) 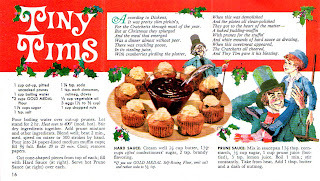 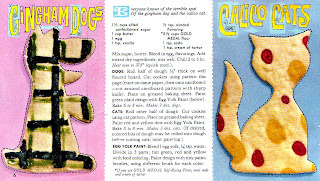 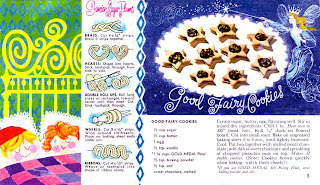 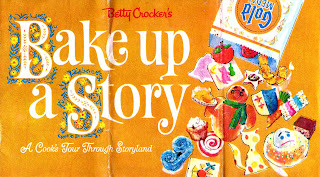 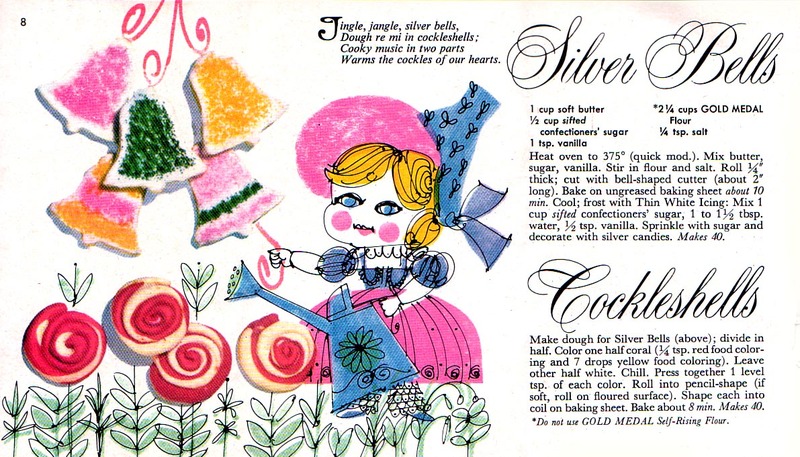 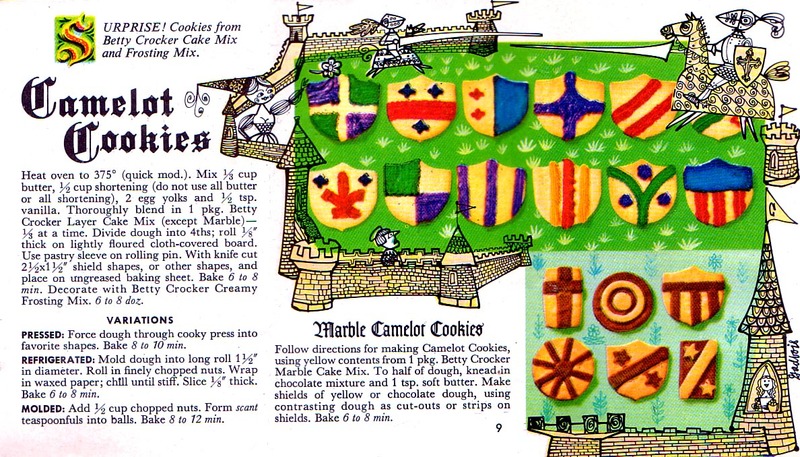 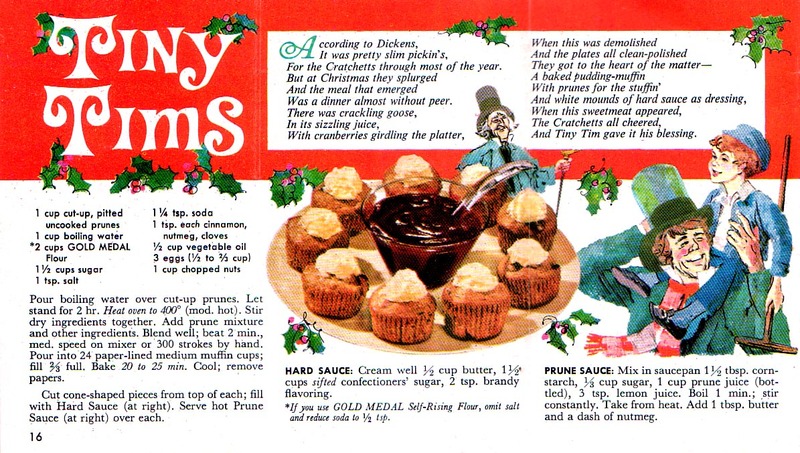 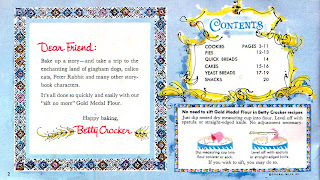 Betty Crocker mini-cookbook pamphets. 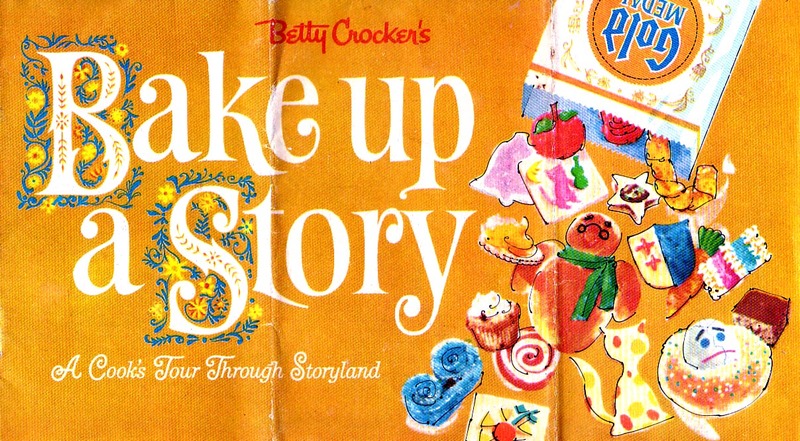 We'll be taking a delicious "Cook's Tour Through Storyland" visiting flavorful fabled lands and the crunchy characters that inhabit them, and I for one simply cannot wait to sink my teeth into Cinderella's Slipper! 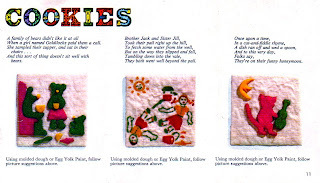 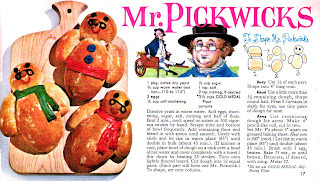 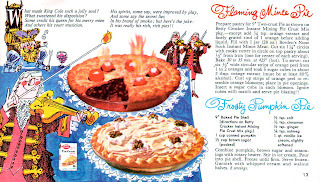 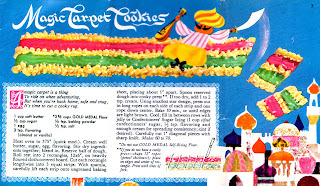 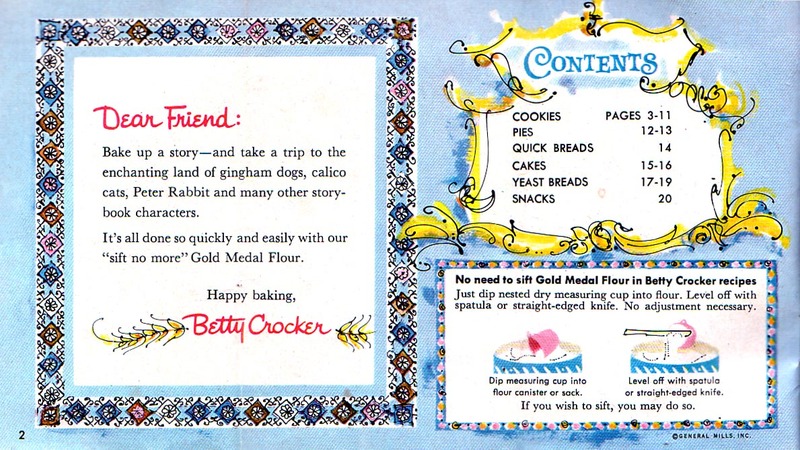 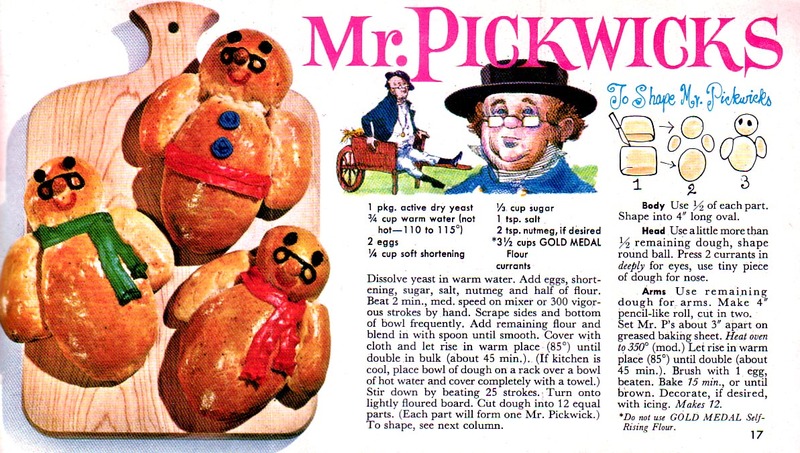 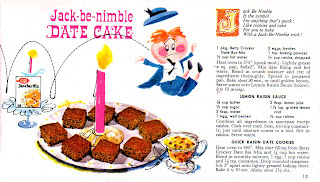 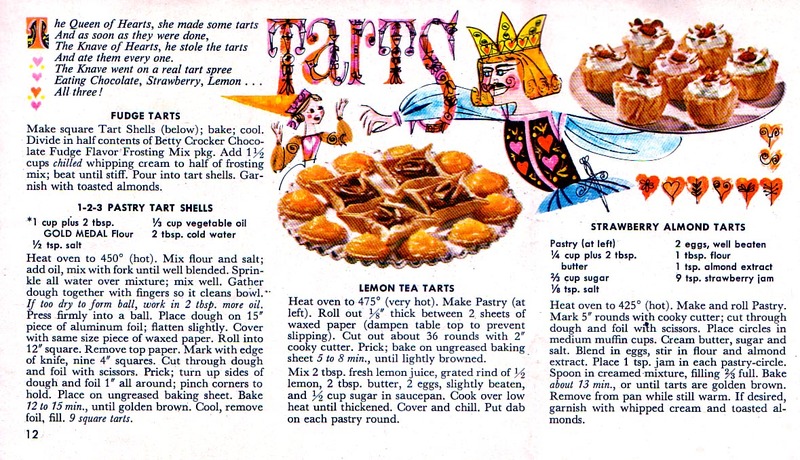 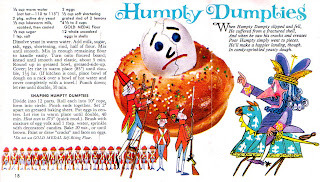 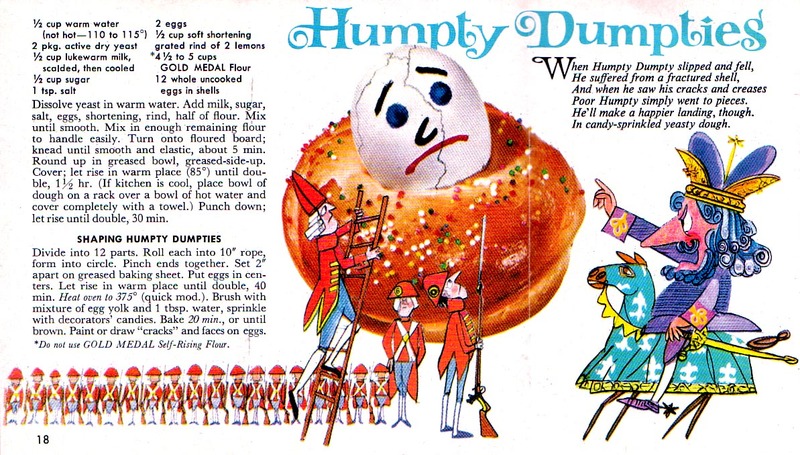 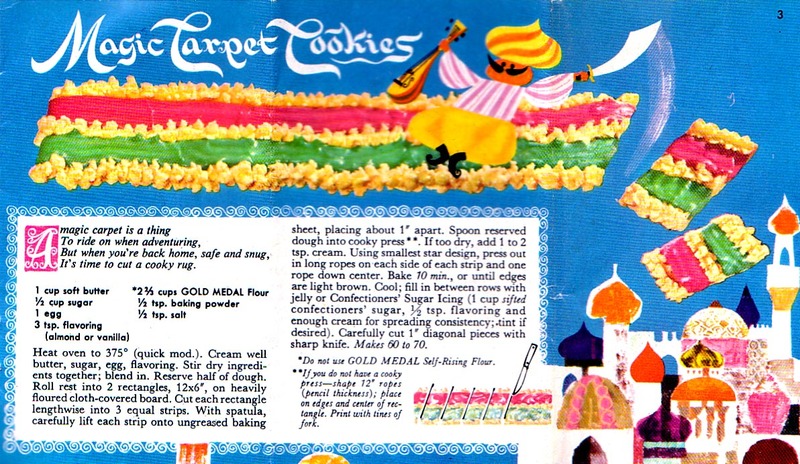 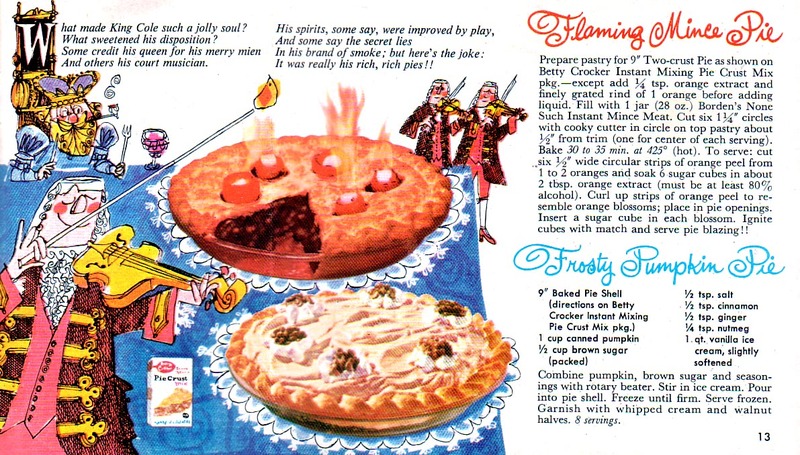 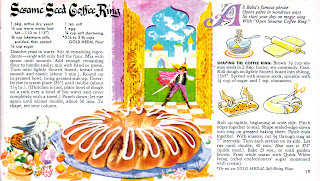 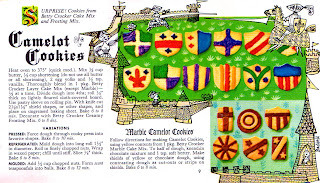 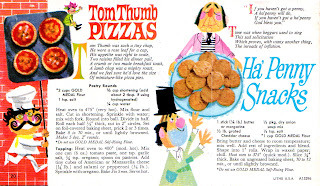 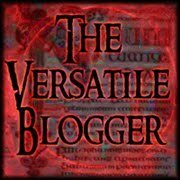 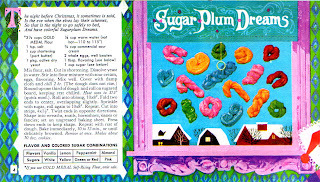 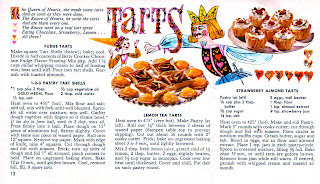 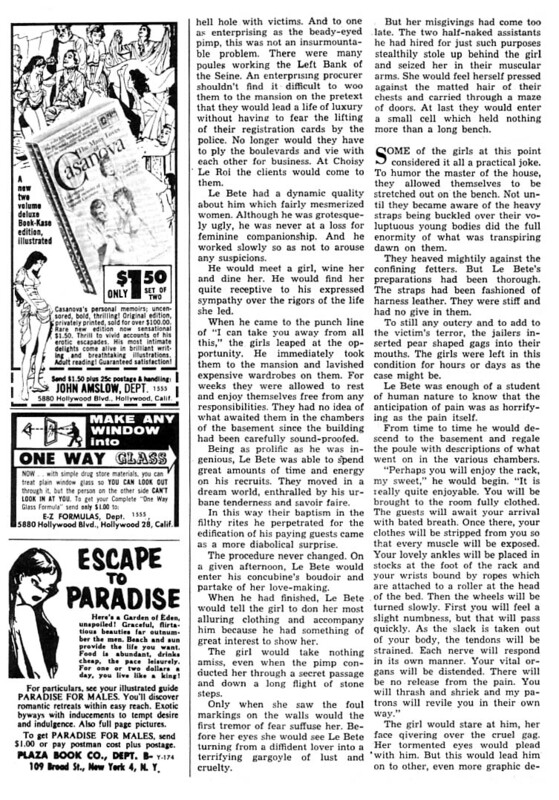 So whether you're flying to new heights with a Magic Carpet Cookie, jumping for joy with a Jack-Be-Nimble Date Cake, putting cracks in your diet with Humpty Dumpties, or burning off the roof of your mouth with a Tom Thumb Pizza, you can be sure that these tales will be the best you have ever eaten!